Welcoming a baby into our world is a wonderful yet very complex process. Many physical and emotional changes occur for mother and baby. The baby’s body systems must adapt to the new surroundings and work together in a new way. Sometimes, a baby has difficulty making the transition to the world. Being born prematurely, having a difficult delivery or birth defects can make these changes more challenging. Fortunately special new-born care is available. New-born babies who need intensive medical attention are often admitted into a special area of the hospital called the Neonatal Intensive Care Unit (NICU). The NICU combines advanced technology and trained health care professionals to provide specialized care for the tiniest patients. NICUs also have intermediate or continuing care areas for babies who are not as sick but do need specialized nursing care. The Neonatology (NICU) at NICE Hospital is a Level III neonatal unit. We offer the highest level of care for neonatal diagnosis, surgery, and rehabilitation. 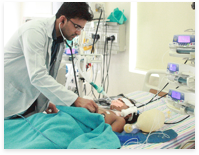 The NICU unit comprises eight ICU’s and is fully equipped with latest medical technology to care for new-borns with complex medical problems. We offer the highest level of intensive care with the assistance of advanced equipment’s like GE Giraffe incubators and all required infrastructure to care for new born. 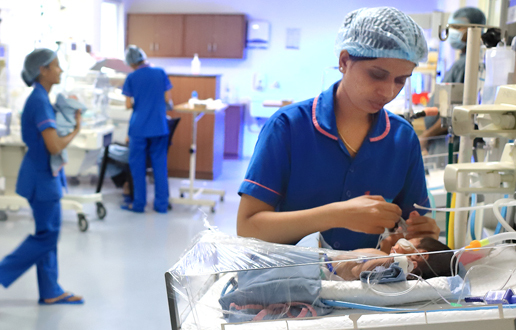 Since the systems and procedures at the NICU are different from the regular ward, its team consisting of doctors, nurses and other staffs are indigenous and specially trained to care for new born. At any given point of time, there are doctors with intensive care skills available in the unit. All our beds in the units are monitored by a camera and so are our consultations rooms, which in turn facilitate transparency and reduces error margin. At NICE Foundation we believe in doing simple things ethically and the right way.